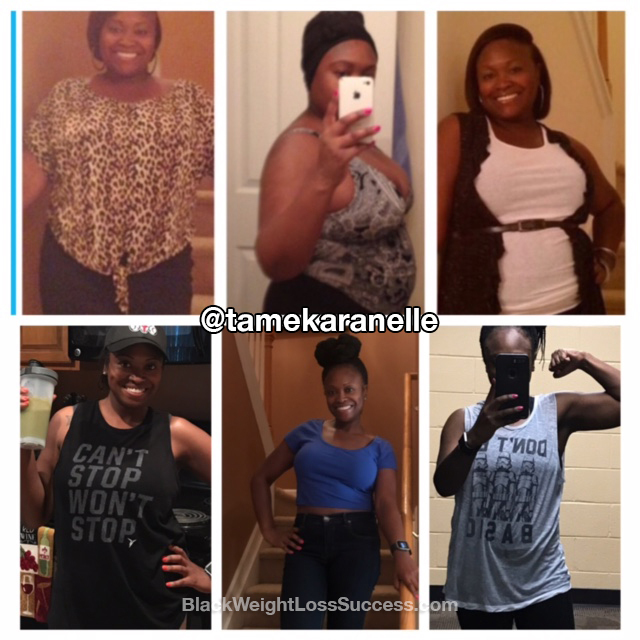 Transformation of the Day: Tameka lost 53 pounds. She was motivated to live a healthier lifestyle when she began to worry about her own mortality. A hypothyroidism diagnosis also added to her concerns. 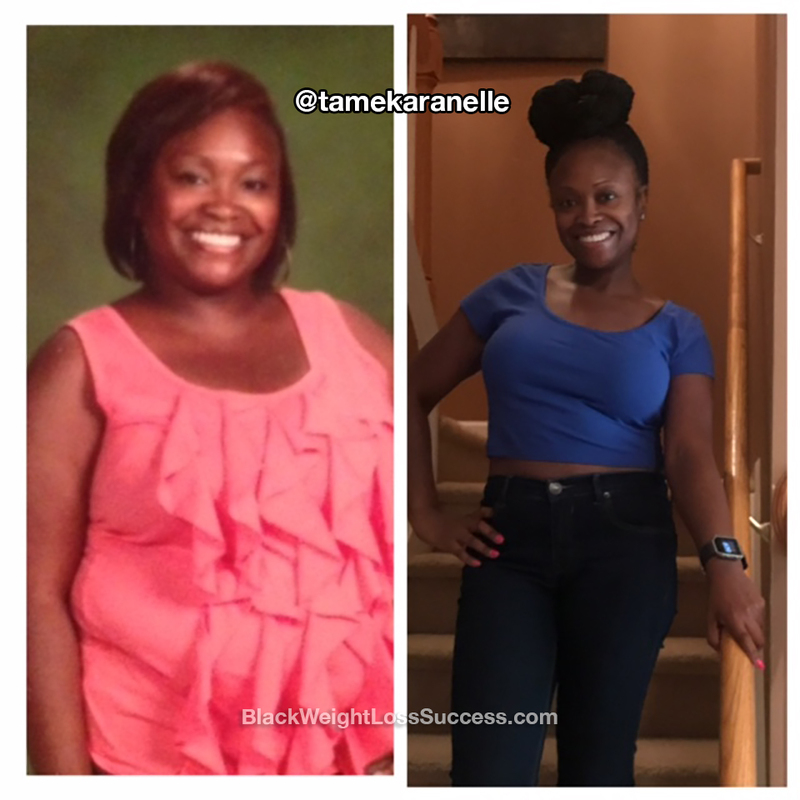 Working out at home, Weight Watchers, My Fitness Pal and the Green Smoothie Cleanse were all factors that contributed to her success. Check out what she shared with us. My motivation to make this lifestyle change was when I literally felt like I could go to sleep one night and not wake up. In fact, I used to ask my brother to text me when he got up to make sure I woke up the next morning. In addition to this, I diagnosed with hypothyroidism a few years back. To change my eating habits, I initially just cut way back on soft drinks and other sugary drinks. I started drinking a gallon of water each day. When I began this journey, I followed the Weight Watchers program. I lost about 40 pounds on this program. After about a year, I continued tracking my food, but instead of Weight Watchers, I used the MyFitnessPal App. Just recently, I got into drinking smoothies. I have completed two full cycles of JJ Smith’s 10 Day Green Smoothie Cleanse. When I am not on the full cleanse, I follow the modified plan. This includes 2 smoothies and 1 sensible meal. When I first started this journey, I worked out at home doing cardio dance videos. I was later invited to a Zumba class and fell in love with it. About 3 years ago, I became a member at the local YMCA, where I now teach several classes. For a year, I have been working with a personal trainer. I workout 6 days a week. My only rest day are Sundays. I started my journey on March 12, 3012. My initial transformation only took 6 months. When I wanted to give up, the thinking about the results I had already achieved kept me going. I would look at my before and after pictures for inspiration. This helped me keep my mind focused on living a healthier lifestyle. The advice I would give others who want to lose weight is JUST DO IT! Stop putting it off. I would also tell them that it is THEIR journey. Don’t worry about what others have to say.